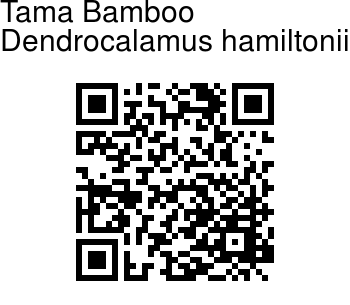 Tama Bamboo is a species of bamboo, 1215 cm in diameter and growing up to 15-18 m in height. It is a tall, dull green-colored bamboo species with drooping tops, which grows in thickets consisting of a few closely growing culms. Culms are dull green covered with whitish-brown hairs, which become dull brownish-green when dry. Whitish bands occur below and above the nodes. Culms are noticeably zig-zag. Branching occurs from the base to top. Aerial roots are present in all nodes. Culm walls are 0.5-1.5 cm thick. Culm sheaths are green when young and turn yellowish brown when mature, and are long and gradually tapering upwards from a flattened base. The sheath proper is 18-45 cm in length and 15-28 cm wide. Blade length is 8-20 cm. Auricles are absent. Upper surfaces of the sheaths are covered with patches of blackish-brown hairs. Sheaths fall off early. Pseudospikelets are 10-25 per node, clusters 1-4 cm in diameter. Spikelets are dark purple, 8-10 x 3-5 mm, hairless; fertile florets 2-4. Glumes 1 or 2; lemma 5-7 x 6-7 mm, tip long with a short sharp point. Anthers are yellow or red-purple, tip apiculate. Style is about 4.5 mm; stigmas 1-3, red-purple. 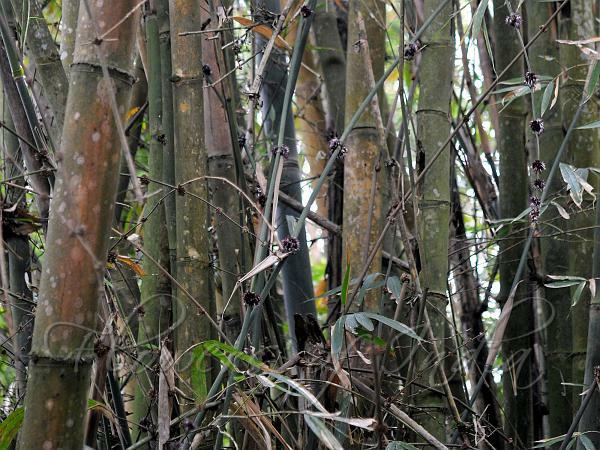 Tama Bamboo is found in East Himalaya, particularly Assam. It also grows in Bangladesh, Cambodia, SC China, Laos, Myanmar, Nepal, Thailand, Vietnam. Identification credit: Manoj Chandran Photographed in Kalimpong, West Bengal.